Frugal Mom and Wife: Free Redbox Movie Rental Code For Valentines Day! 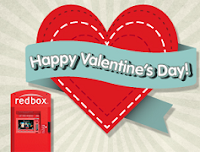 Free Redbox Movie Rental Code For Valentines Day! Simply use code: "HEART" at your local Kiosk or online. 1 time use per user on Valentines' Day Only.